The Disney Parks Blog posted some "throw away" post the other day about Totally Minnie…just an excuse for them to share an old photo and make fun of the fashion. But this inspired a new series for 2014…that I will call 1980's Nonsense. I had heard the term Totally Minnie thrown around from time to time, that happens when you blog about random Disney artifacts, but I never actually realized what it was. 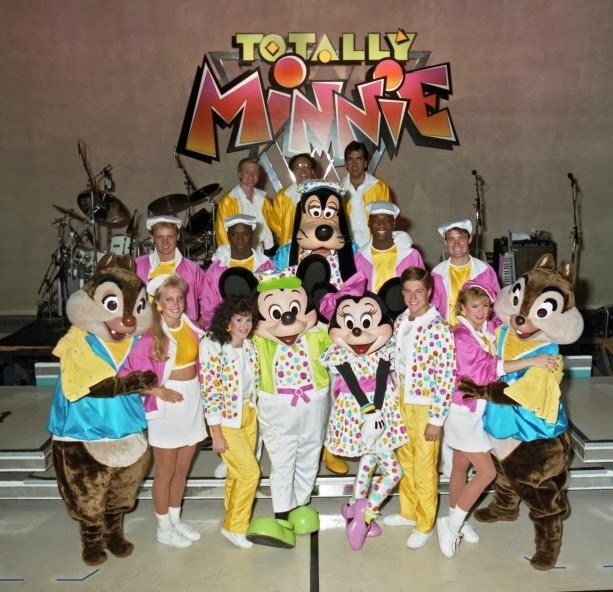 As it turns out, Totally Minnie was the first television special featuring Minnie Mouse as the star…which had a subsequent foray into the parks…and an album of songs, which is still available on iTunes. Why in the world didn't I know about this??? So…the stage show wasn't all that bad actually, right? At least the singing is live, which is almost never the case today. Plus, between the awesome dance moves and the quick song changes, the show never really has time to drag. The highlight of the entire thing is the Country Bears making a cameo, and Minnie referring to Shaker by name, which is AH-MAY-ZING. Also, Mickey singing about Mr. Toad…the best. Why isn't a show like this still playing? Have you heard of Mickey Unrapped? It was a tape full of 90s cover songs done by the Fab 5 and I listened to it over and over as a kid. My favorite was always "Whatta Mouse"
I had the Totally Minnie vinyl record and listened to it over and over. I remember specifically the exercise song and Hey Mickey (natch). It may or may not be in my parents' attic right now.